Data Mining is an area of computer science that studies the problem of discovering interesting or meaningful patterns in large data sets, and develops knowledge out of the discovered patterns. With the advancement of computing technologies, the importance of data mining has increased. 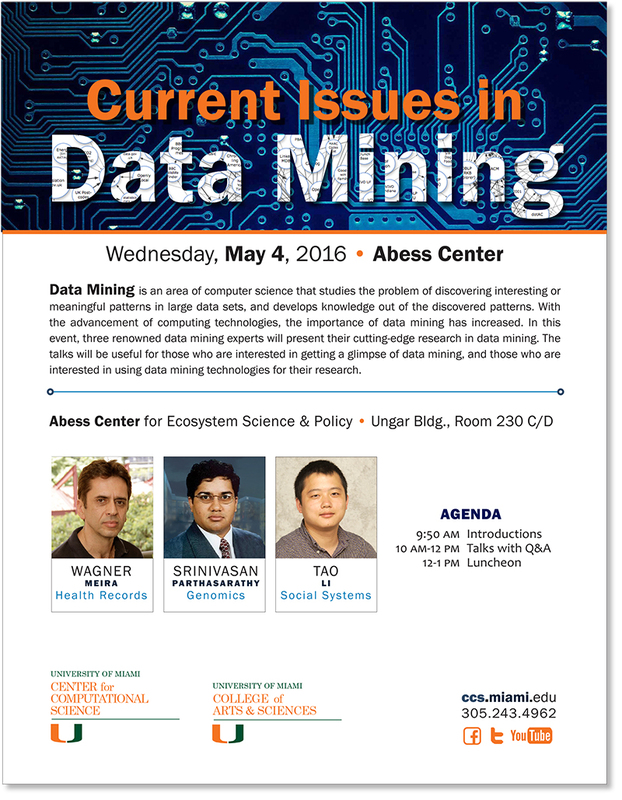 In this event, three renowned data mining experts will present their cutting-edge research in data mining. The talks will be useful for those who are interested in getting a glimpse of data mining, and those who are interested in using data mining technologies for their research. The Symposium takes place on Wednesday, May 4, 2016, 9:50 AM – 1:00 PM (lunch is included). Space is limited, so please RSVP to ccsadministration@miami.edu, or call 305-243-4962.